All transactions are safe and secure with a reliable history in online purchasing behind each of our associates. 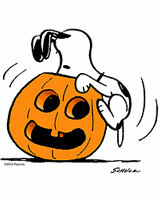 Buy the Snoopy Jack O' Lantern t-shirt to own Snoopy clothing and merchandise. Usually, we hear the saying, "Curiosity killed the cat," but here curiosity has left the world's favorite beagle in a perilous situation. No fear, surely Snoopy will emerge unscathed. We can't say the same for the pumpkin. This Snoopy t-shirt features him looking inside a Jack O' Lantern, causing it to tip over. Pop in a DVD to see some of his other classic shenanigans or read about them in a Snoopy book. Enjoy them from the comfort of your beagle bedding surrounded by your vintage Snoopy action figures. In addition to the Snoopy Jack O' Lantern tee above, browse the Snoopy Clothing Gallery for more apparel like men's and women's clothes, kids shirts or hoodies.